We had been looking at trawlers for months as we wanted to make the transition from our Catalina 42 sailboat to a nice, warm, dry powerboat. We had a buyer for our Catalina, but the trawler we thought was our “ Dream Boat “ , surveyed as a potential nightmare. My plans of enjoying the tax benefits of a trade-in dissolved, and we decided to go ahead with the sale of our beloved Catalina and take a break from searching for the perfect boat. That afternoon the phone rang…it was Bob Berglund, who had been helping us with our search. He said “I’ve just listed a beautiful Grand Banks 42 Classic, and I think it’s YOUR boat!” Suzy was so depressed, she didn’t feel she could look at another boat, but she agreed to “ go through the motions “ one more time with me. The next morning, we were on board the Grand Banks with Bob. After 30 minutes looking her over, Suzy said, “ Bob has done it again! This is our boat! Let’s make an offer! “ ( Bob had found us a beautiful Catalina 36, seven years ago! ) To make a long story even longer, Bob was able to get the survey the next day, and make the transaction happen, so we were able to save the tax benefits after all. I’ve dealt with many brokers… and Bob Berglund is the BEST ! After three frustrating years of trying to sell my 54’ Sunnfjord power boat by myself and through brokers, I decided I needed to do a more thorough job of “brokerage due diligence”. I made myself an in-depth checklist and began interviewing brokers from Anacortes to Olympia, concentrating on the Seattle area because of visibility and traffic. I chose Dana Motlik and NWyachtnet because they had been moving inventory in 2008 and 2009 when many other brokerages were not, and because they had an excellent reputation for co-brokering. NWyachtnet bears that name for a reason: They are constantly networking within the boating community, posting inventory and sharing inventory with other brokers, including Canadian brokers. I also liked their office location and the modern, convenient and secure marina that offers great visibility to locals and tourists. 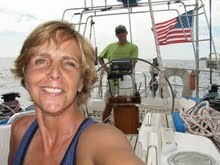 The NWyachtnet crew are active, knowledgeable, professional, and very comfortable to work with. And they did, in three months, what I couldn’t do in three years: They found a wonderful home for my boat! I wanted to take a few minutes to write you and let you know what a wonderful experience we had buying our boat from NW Yachtnet.com. We were only looking to spend 35 to 40 thousand dollars on a boat, yet Matt treated us like we were shopping for a million dollar boat. His service was professional, and helpful, with no high pressure tactics that you see so much of today. We ended up with a wonderful 32 ft Cooper, which fits out boating needs perfectly. There were a few bids ahead of us when we decided on the boat, and I was ready to give up, but Matt told me to hang in there. He told us you never know what will happen when it comes to finalizing on a boat. He was right. Some things came up for the people ahead of us, and the boat came to us. We have had the boat a little over a year now, and Matt stays in contact with us, making sure we are happy, and keeping us aware of what is going on in the boating world here in Tacoma. We are in the starting stages of looking to get a bigger boat, (we were told that once you had a boat you will always want one 2 Ft. bigger), and we will only work with Matt. I know he will have our best interest at heart when we buy the new boat. “We met Mike Locatell in 1998 when we began looking for a good sailing, cruising boat to replace the small racing boats we had owned previously. Since that time, with Mike’s assistance, we’ve purchased two boats and sold one using Mike’s services. I don’t think there is a better sailing yacht broker. Mike has a broad base of knowledge across this industry. He knows the boats, he understands the transactions, and he is genuinely concerned with the desires and welfare of his customers. He listens to his customers, he is patient, he makes useful suggestions and he can lead through the purchase process. He understands the intricacies of any deal and we’ve never had any problem with purchasing arrangements. After purchase he has never failed to be a very useful resource for advice and information. He’s become a good friend. We’ve taken our present boat from northern California to Mexico and back and across the Pacific to Australia. Our cruising plans are working out and we’re having fun. A big part of that is having a boat which does what we had hoped it would do, and for that, Mike’s advice and service has been invaluable. More information on the voyages of Airstream is at www.airstreamvoyages.blogspot.com. “When I decided to return to sailing after many years absence, I knew I needed more than just a little help with the mechanics of purchasing a boat. I needed guidance through the process of deciding on what type of boat would work for me, narrowing down the list based on personal preferences and practicalities. One of the best pieces of advice I got early on came from a well known circumnavigator and offshore lecturer: he said “you want Mark Gilbert as your broker”. Mark spent hours talking with me, getting an idea of who I was, what my sailing ambitions were – all before suggesting any boats. Mark kept asking, What are you going to “do” with your boat? That was the practical basis from which he guided my decision making process. Initially, since I couldn’t afford a new mega-yacht, I figured I’d be a back-burner client. Not true. Mark was constantly available – calling on evenings and weekends as developments arose. As we started looking at – and especially talking about – the available (and suitable) boats, Marks’ long and extensive experience and knowledge base was so valuable. He was able to objectively critique and evaluate the various boats we considered. Mark would write up cost analyses and pros and cons regarding general condition, equipment, etc. He patiently answered all my questions. Once Mark found the “right” boat, he continued to guide me through the jitters of obtaining surveys (I surveyed everything). He helped me find the right surveyors, helped me to understand their reports, and was able to provide keen insight regarding valuation that allowed me to get a high quality sailboat, excellently equipped, for a relatively modest price. Before the final negotiations were complete, I knew the boats faults, what repairs and upgrades were necessary – and at what cost; Mark even recommended the riggers that are re-fitting the boat! Through-out the entire process, Marks’ warm humor and attention to detail provided a basis for the trust that made the entire process enjoyable and productive. In short, my return to sailing has been successful and enjoyable – in large part because I was expertly guided through a complicated process by a caring professional. I could not recommend Mark more highly. “Having encountered Mike Locatell as a lecturer at a 2001 boat show cruising forum, I was impressed with his in-depth knowledge of the myriad details involved with offshore sailing. I remembered thinking that he seemed to be a bit of a ‘know it all’, but when I approached him after the lecture, I realized that when it comes to this subject – he really does! Upon discovering that it would be a long two-year wait time for delivery of a new Hallberg-Rassey, I conferred with Mike about the impressive Swedish Malo yachts and contracted for an ideal model that we could take delivery of in 6 months’ time. Then came the unexpectedly numerous choices in layout, finishes, outfit and more. Frankly it would have been overwhelming without Mike’s input on the future implications of each and every choice. And we’ve never been sorry for any of the decisions made during this critical time. International exchange rates, tax issues, customs, shipping choices and more all had to be navigated along the way, and Mike’s first-hand experience helped to keep the process easy and worry free for us. Going well ‘above and beyond’ in every way, Mike accompanied us to the boat yard during construction, as well as making the trip to Europe again to help us take delivery. Having cruised himself in the area, his personal contacts at Port Grimot in Saint Tropez were a great help in deciding where and how to deliver our Malo 41 so that we could begin cruising the French Mediterranean’s most spectacular waters right away. 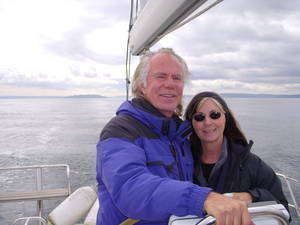 “I’m not sure where to start when trying to explain why Discovery Yachts ( now NW Yachtnet ) was the right choice for me, but one reason I decided to seek help was that I had been going to the Seattle Boat Show for the past 3 years and was only becoming more confused about a boat that I wanted to settle into. Secondly, I live and work in a very small town in Southeast Alaska. Thirdly, I’m not very swift with a computer. The Discovery Yachts storefront was very distinctive and it had been there a long time, so I made the leap. What did I have to lose? After giving Mark Gilbert a brief boating history, what I wanted in a boat, price range etc., we set our sights on a motor sailor with good above deck visibility. Mark was extremely helpful in sending me lots of information on boats that fit my criteria and he had a complete understanding of each boat, it’s sailing and motoring charactaristics, maneuverability in tight harbors, the internal system and their pros and cons. Mark’s knowledge of newer systems was extremely important as my experience was in 40-70 year old vessels. Mark always gave me just enough insight to help me make intelligent comparisons among the many choices. He always gave me plently of time to digest all the new information, never hurrying me. Once the right boat came along and I was ready to take the next step, Mark chose surveryors and mechanics that were top in their field and arranged a haul out. The surveyors he chose went through everything thoroughly giving me great peace of mind. Next came the negotiations and this is where Mark truly shined. Once the deal was done, Mark went over survey recommendations with me before sailing to Alaska. He got me multiple quotes on work that needed doing and helped me with upgrades, as well as changing over the radio, radar and epirb licensing. If that wasn’t enough he showed up at 5:00 a.m. the day of my departure to help me negotiate the passage from Lake Union through the Locks to Shilshole.